In the implementation of Carrier Aggregation, adding the SCell (SCC : Second Component Carrier) is conceptually not so complicated, but some complications are added in terms of some MAC/PHY operation like MAC Activation/Deactivation or CSI report. To control MAC/PHY operation in sophisticated manner, it became necessary to properly indentify the ID (index) of each cells. ServCellIndex and SCellIndex are RRC layer indicator to indentify each Cells in Carrier Aggregation and these Index are linked to MAC layer Cell IDs as will be described in this page. SCellIndex is used for itentifying each Secondary Cell (SCC : Secondary Component Carrier). It is configured in RRC message and mapped to MAC-CE for MAC Activation/Deactivation process as illustrated below. Following 3GPP documents will give you the formal definition of SCellIndex and mapping between MAC-CE and SCellIndex. The IE SCellIndex concerns a short identity, used to identify an SCell. ServCellIndex means 'Serving Cell Index'. What is the serving Cell ? If it is Single Carrier (Non-Carrier Aggregation), the answer would be simple, but in case of CA(Carrier Aggregation), the term Serving Cell can be confusing. Does Serving Cell mean PCC (PCell, Primary Component Carrier) ? Not necessarily. It can be PCell only or PCell and SCell depending on the situation. Simply put, Serving Cell mean all of those cell (PCell or Scell or Both) that are currently in communication with a UE. 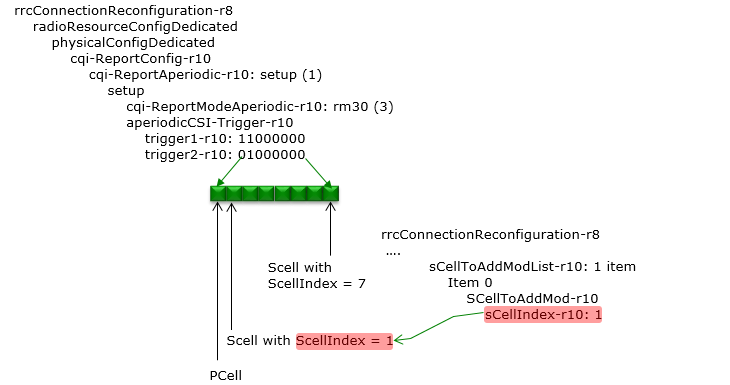 In most case, ServCellIndex in RRC Message is not specified and regarded to be 0 by default. The formal definition of ServCellIndex in 3GPP is as follows. The IE ServCellIndex concerns a short identity, used to identify a serving cell (i.e. the PCell or an SCell). Value 0 applies for the PCell, while the SCellIndex that has previously been assigned applies for SCells. One of the most common use case of ServCellIndex is in relation to CSI Report trigger setting as shown below. Each bit field of the Trigger indicates ServCellIndex and the bit field maps to PScell and each of the SCell as illustrated below.